Pace Freight Systems was incorporated in February 1977 to become a southwest regional trucking company primarily servicing the airfreight, ocean LCL and surface cartage markets. We have since become a LA Port Concessionaire for FCL shipments and provide warehousing, packaging and distributions services. We have permitted Intra and Interstate authorities. In addition we are licensed by US Customs with a CHL (Common Carrier) authority. Our company vehicles, terminals and employees are insured for total coverage’s up to $1,000,000.00. All insurance and bonding filings are up to date. PACE currently operates over 30 pieces of company owned equipment outfitted with Verizon communication equipment driven by company employees. All vehicles are uniformly painted and logoed with are company colors (white & red). Sizes vary from 1 ton vans to 48” tractor/trailers, with the emphasis being on heavy equipment. Over 80 % of our equipment was acquired within the last 5 years, and have been regularly maintained by our service contractors in compliance with all state and federal safety regulations and law. Our fleet is compliant with California state ARB regulations and participates in the California Highway Patrol administrated BIT inspection program. 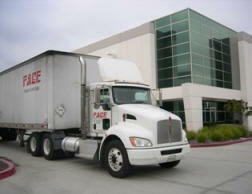 PACE Freight Systems provides service for Los Angeles, Orange and San Diego counties. Additionally, we cover several points in Ventura, San Bernardino and Imperial counties. Having terminals in both Los Angeles and San Diego, PACE is able to offer overnight service to all points within the Southern California region. In house computerized tracking allows our customer service staff to trace any shipment and provide up-to-the-minute details concerning the handling of customer shipments. Having computer programming tailored to the specific needs of our customers, we are able to trace by any of the many numbers assigned to freight in transit. For Example: the air way bill, house air way bill, original bill of lading, broker reference, customer purchase order, or even the name of the consignee. We have recently added a web based tracking website that will allow our customers independent online access to their shipments in progress from initiation to final delivery. Updates include status for shipments in progress including any exception notification or any problems in transit. Additionally, we have introduced a financial component that displays shipment charges with the final delivery entry. © Copyright 2013 - Pace Freight Systems. All Rights Reserved.